1753 - A small group of Baptists met in a house in the town and seven years later the first pastors for the growing Church appointed. 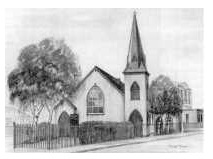 1792 - The first dedicated Church building erected on Wood Gate. 1804 - The Sunday School began which for many years provided basic education for the children of the poor. The number of children attending the school quickly rose and by the 1830s numbered over 800. 1828 - The present building on Baxter Gate erected which was needed because of the increasing membership and needs of the Sunday School. 1846 - A group left the Baxter Gate Church and were allowed to use the old building on Wood Gate. 1878 - An imposing Romanesque building erected on Wood Gate next to the 1792 Church building. 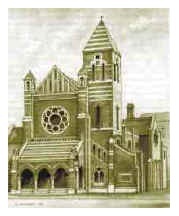 1898 - The third Baptist Church on King Street opened. 1904 - Extensive Sunday School buildings erected over the grave yard of the Wood Gate Church. This also included the demolition of the original 1792 building. 1973 - The first united Church Meeting of the three town Baptist Churches. 1974 - Regular services in the refurbished Baxter Gate worship room began. Many of the town's leading citizens including several Mayors, Aldermen and Councillors came from the three Baptist Churches during the period from the mid 19th century to the mid 20th century. An overview of our history in Loughborough Baptists and the Town £4.95 available from the Church Office.